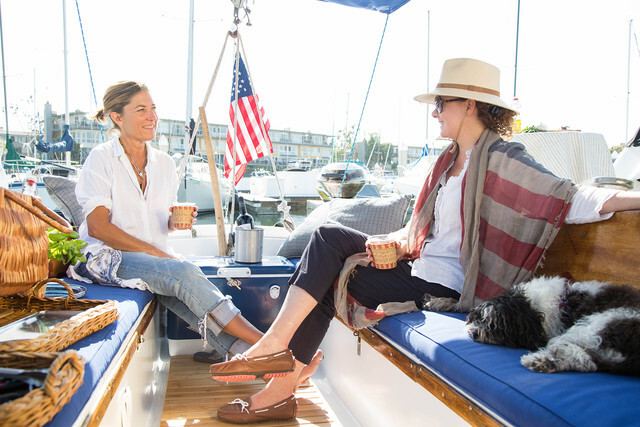 Holly Chamness (right) and friend, stylist Gena Sigala enjoy a day on Golightly. Olive lounges comfortably on custom cushions made by Holly. Holly - Golightly. I mean. How cute is the Breakfast at Tiffany's reference? The name stuck after people called her Miss Golighty through the years. 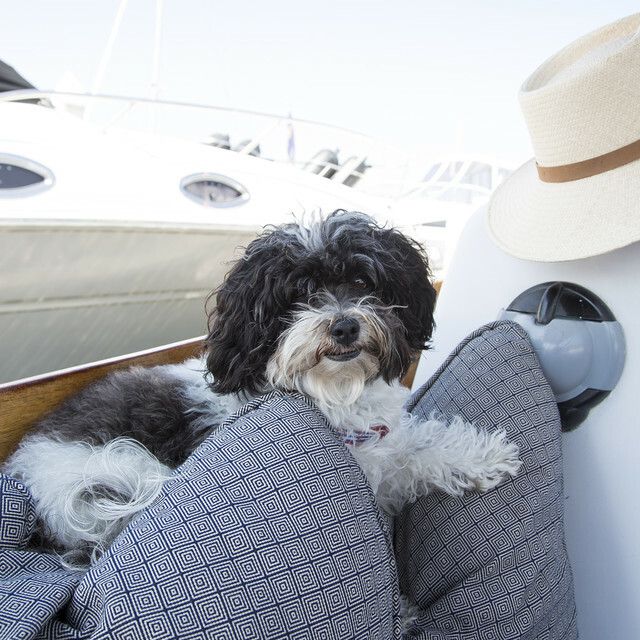 There's no Orangey tabby cat on board, instead, first mate of the ship is Olive, Holly's two-year-old Havanese pup. 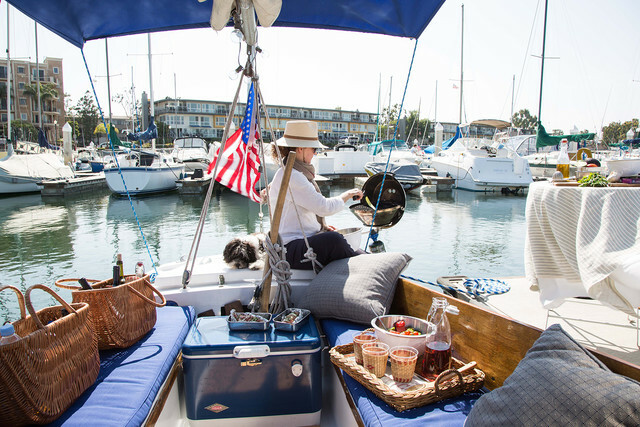 Holly and Olive host friends for frequent sails out of Marina Harbor in Marina Del Rey. "We motor to the breakwater, then point her into the wind to put the sails up, tack a couple of times and we are out, finally turning the motor off, so all we hear is the wind and the water. We sail up and down Santa Monica Bay. 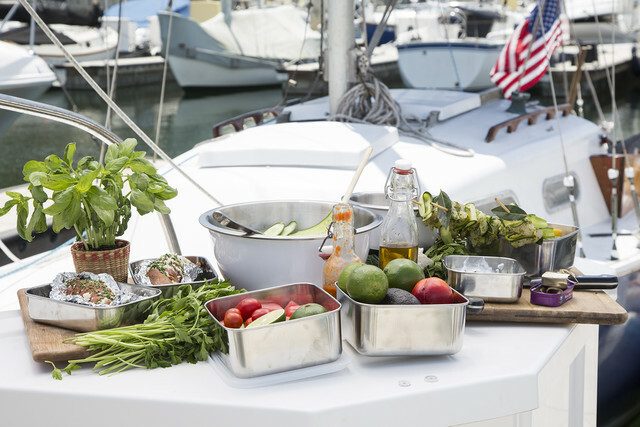 A sail to Malibu is in the near future," says Holly, who also is a great cook and entertainer. (We'll get to that yummy part in a bit!) 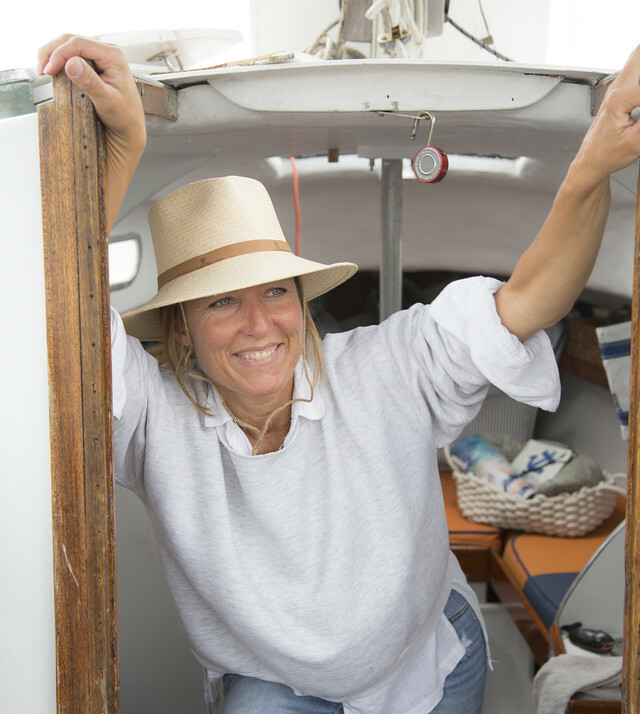 Holly is, in her words, "boat proud" of her beauty and tells me "Pearson's are great boats - solid full keel blue water boats" (Means you can go out in the ocean). Gena preps the area for sophistication and function. 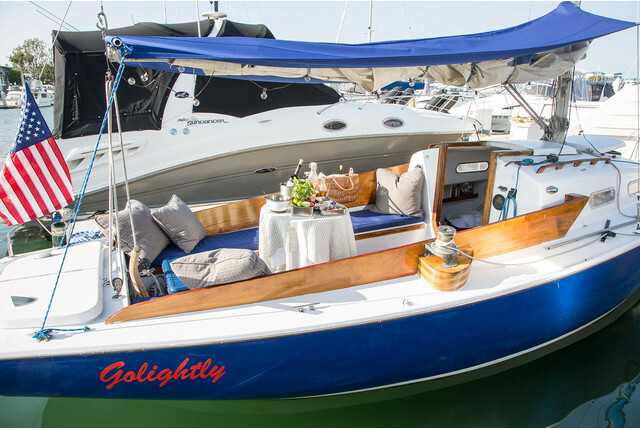 Holly has spiffed up Golightly in lovely fashion, with a completely new paint job inside and out - beautiful bamboo floors and weatherproof cushions handmade by the professional seamstress herself! All that was left was a little storage and organization. 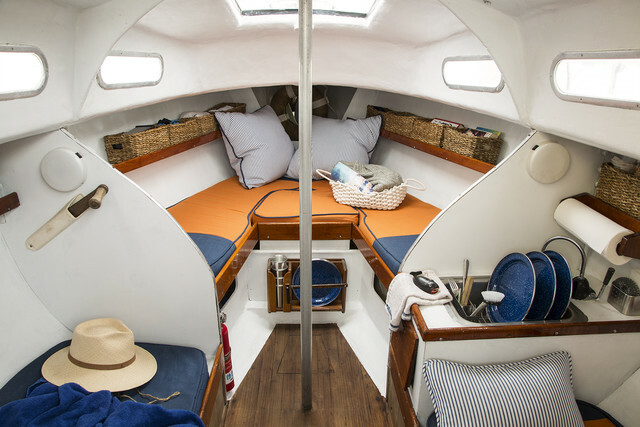 With the help of stylist (and lucky frequent guest) Gena Sigala, the boat's every nook and cranny is now an efficient, seaworthy and stylish use of space. 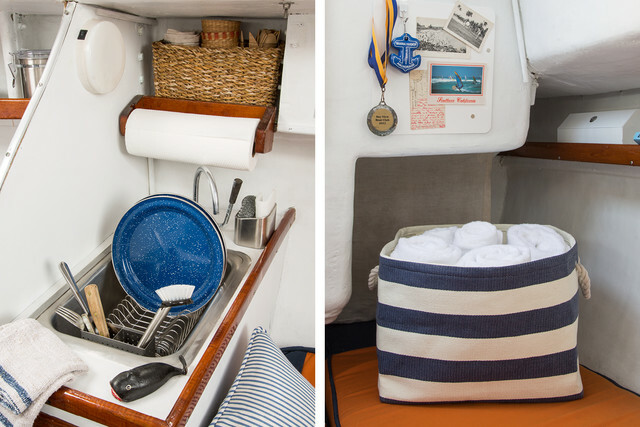 Our Cotton Cable Knit Bins perched on the boat's sitting/sleeping area are as huggable as a sweater but are as durable as sailor's rope! The tight nature of the weave gives the bin structure while the handles allow for carrying with ease. 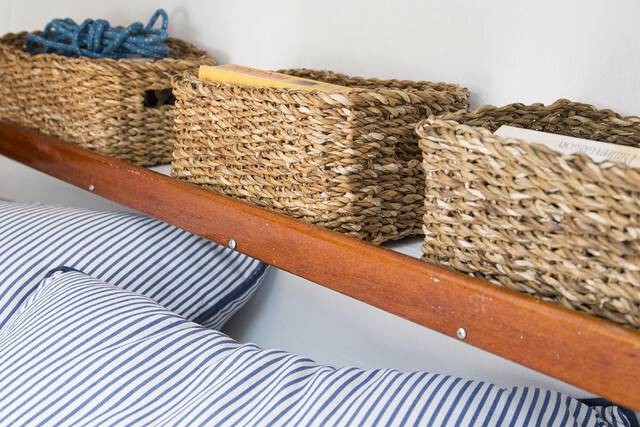 The original ledge shelves on the boat are the perfect place for our hand-woven Rectangular Hogla Bins which fit snuggly across the perimeter of the interior space. The natural fibers add an earthy touch to the living area and keep things contained and corralled even when the waters get a little rough. 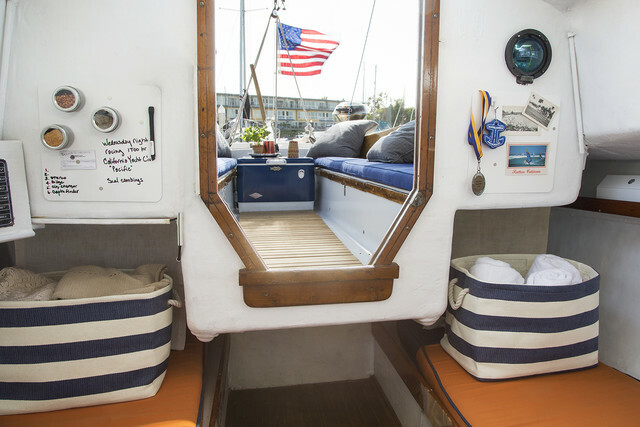 Gena ingeniously turned the limited wall space into functional storage space, using Square Magnetic Dry Erase Boards for hanging mementos and for jotting down notes about the boat's electrical equipment like its radio, pump and charger. 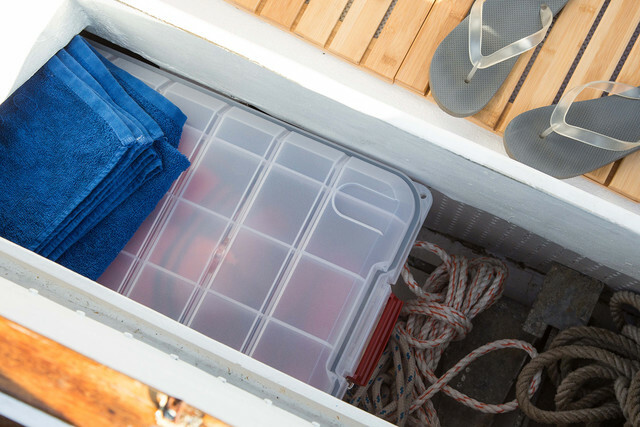 The addition of Magnetic Spice Tins add a great design element while also providing storage for spices, but also things like nails, paper clips or other supplies that Holly needs when out at sea. 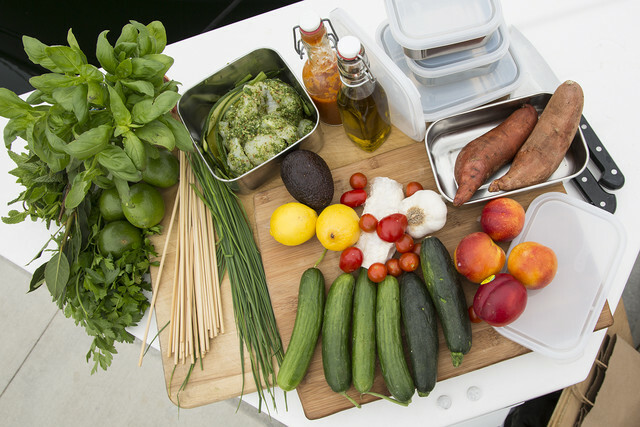 The precious sink area is made even more functional with the addition of a Stainless Steel Compact Dish Rack and Stainless Steel Scrubby Caddy. Another Hogla Bin rests perfectly above to hold supplies. 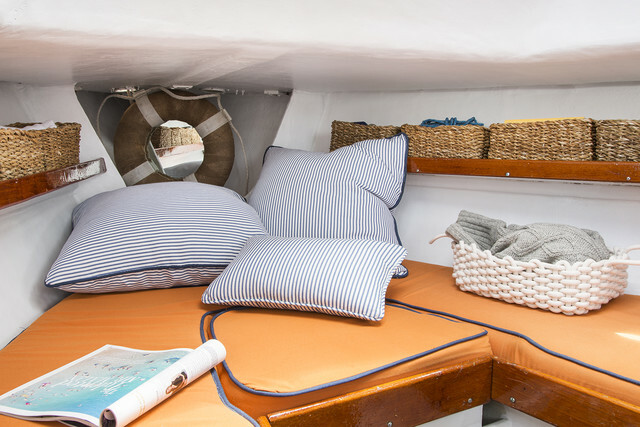 Navy & Ivory Rugby Stripe Bins were the perfect nautical compliment to Holly's cushion handiwork. A Prescription Security Cabinet is also used overhead to corral cords in the boat. 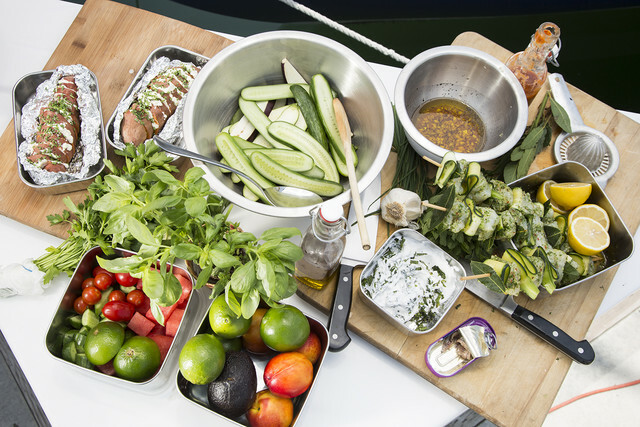 Holly told us her perfect day on the boat involves making a trip to the store to purchase food and doing all the prep work either at home or on the boat. 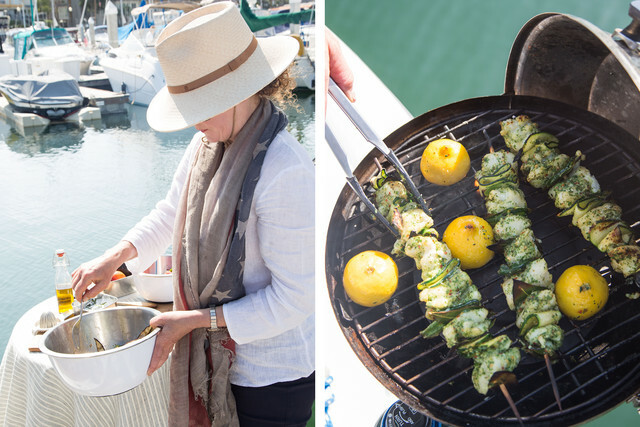 It continues with a a sail out of the harbor and then coming back to dock and cook for a lovely sundown barbeque with her guests. 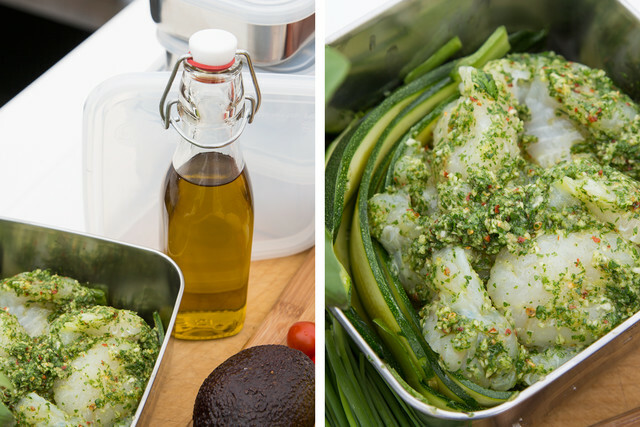 Stainless Steel Square-to-Go Containers and stainless Mixing Bowls are great for meal prep and storage. Vintage Glass Milk Bottles and Square Hermetic Bottles serve as beautiful vessels for vinaigrettes, dressings and oils. 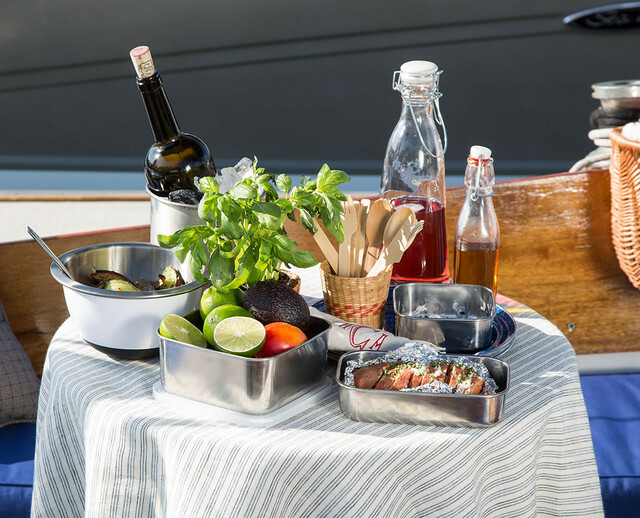 Stainless Steel Utensil Holders are large-capacity and look stylish on a countertop while keeping even bulky kitchen utensils neat and within reach. They're multifunctional too and work well in a bathroom or office space. As I mentioned earlier I'm sure an invite for a sunset dinner cruise is on its way. 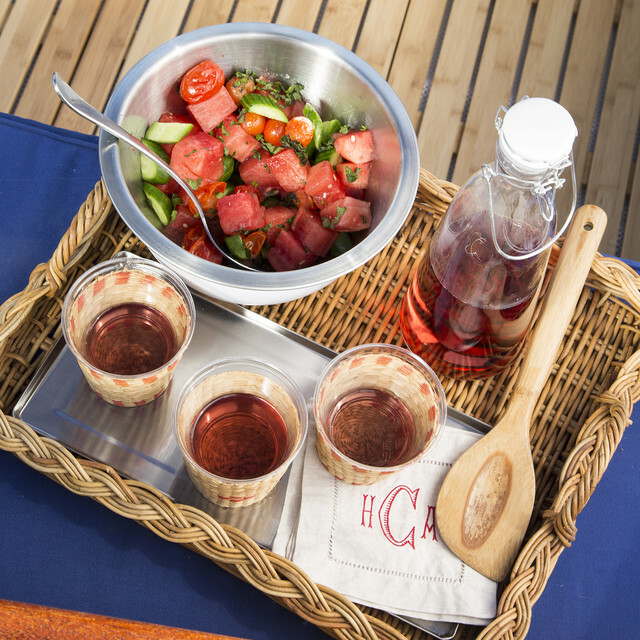 But just in case you don't have your own water ride but do have a backyard grill, Holly shared some delicious recipes that are fabulous for an evening with friends no matter where you are this summer!